TAMPA, FLA – There has been no shortage of criticism directed at Browns head coach Hue Jackson throughout his three seasons in charge. It’s sort of par for the course when you have only three wins in 39 games. Jackson didn’t do himself any favors in Sunday’s 26-23, overtime loss to the Tampa Bay Buccaneers. On two separate occasions, the Browns head man decided to go for it on fourth down in the red zone. Both times, the offense came up empty. In a game that ended in a three-point loss, those two failed attempts cost the Browns dearly. The first attempt came just before halftime, with 26 seconds left before the intermission. A Buccaneers fumble had set up the Browns at the Tampa Bay 19 with a great scoring opportunity. But after gaining only eight yards on the first three downs, Cleveland faced a critical fourth-and-two. At that point in the game, the Browns had scored their only points on a safety in the first quarter and trailed 16-2. The offense had gone three-and-out four times and had barely crossed the 50 on its own twice. Jackson explained that those struggles were a major reason why he decided to go for it in that situation. The second fourth-down attempt came at a much more critical time of the game, with the Browns trailing the Buccaneers 23-16. 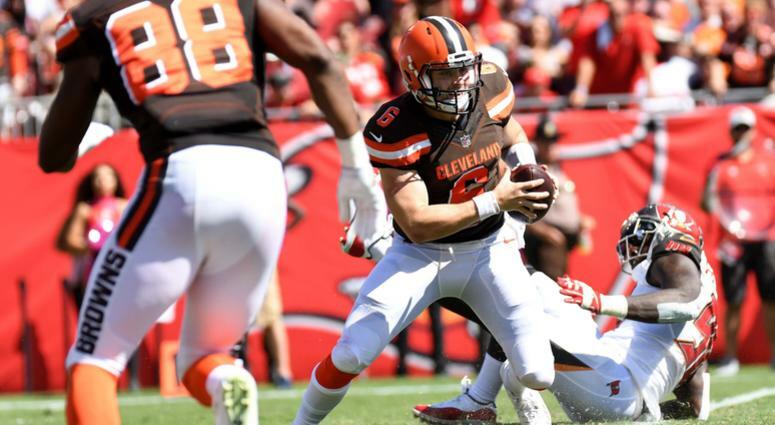 From their own 20-yard line Mayfield marched the Browns to the Buccaneers ten for a first-and-goal. Two plays later they were at the two but Nick Chubb couldn’t punch it in on a run to the right side. Without hesitating, Jackson kept the offense on the field for fourth down and wanted the ball in Mayfield’s hands on a QB sneak. It was stuffed. There’s certainly nothing wrong with Jackson looking to spark his offense and be aggressive from time-to-time. However, in a game that ended in a three-point overtime loss, opting for a field goal on even just one of those possessions could have resulted in a Browns win, in regulation nonetheless. Instead, Jackson went for it on fourth down twice and left a possible six points on the table. In 2016, Jackson was handed a completely depleted roster and asked to win games. He won one. Last year the foundation of a respectable roster started to take shape but they couldn’t win a single game. It was easy during those first two seasons to chalk up the Browns shortcomings as a lack of talent on the roster. This year though, there is plenty of talent, which magnifies the influence of Jackson’s decisions. In this case, two questionable decisions essentially cost the Browns a win and they could ultimately cost Jackson his job.